High-quality case can only compatible with the iPad Air/Air2/Pro 9.7/(2017/2018) iPad 9.7''. Hand straps can release hands, so that the hands can take more things, you can also act as a fashion handbag. Extra package can be placed mobile phone replacement bank card, multi-function portable iPad bag. High stand stability, adjust different angles as you like, remain comfortable when you watch video. effectively prevents your iPad from getting scratched, dust and smudges. 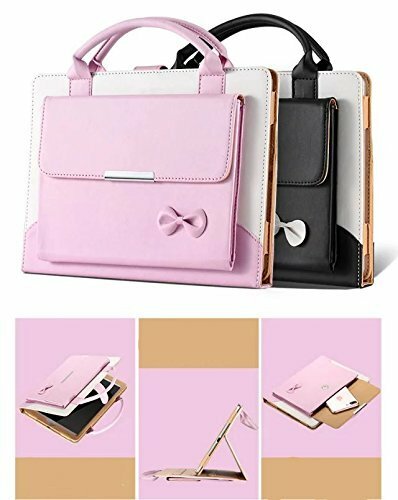 Beautiful colourful bowknot design cute case for girls, Portable handle and lightweight to take alone, or slide it into your briefcase, backpack or any other bag, perfect for business, school or travel. Synthetic leather velcro closure for best security.Premium felt absorbs shock and provides the most comprehensive protection for your devices. Has an exterior pocket for extra storage space for cellphone,cables, chargers, headphones, pen etc.